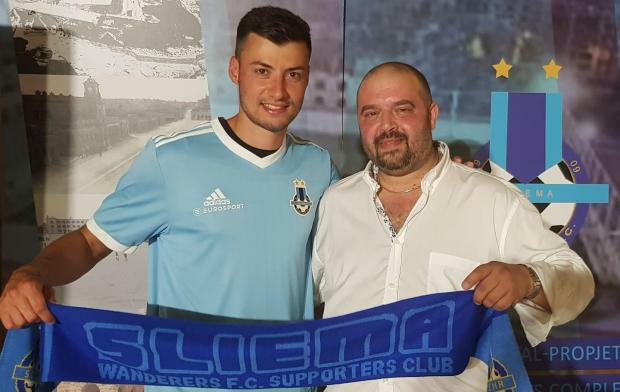 Jean Paul Farrugia (left) will play for Sliema Wanderers next season. 9.15pm That's all from us for today! Join us tomorrow for another day full of transfer news from across Europe. 8.39pm A Bola claim Milan and Sporting CP have agreed terms for Carlos Bacca, but the Colombian is holding out for Villarreal. The striker is in limbo after the end of his loan spell with Villarreal, where he scored 18 goals with seven assists in 43 competitive games. He returned to base, but is not part of Gennaro Gattuso’s plans and time is running out to find him a new club. 7.57pm Both Chelsea players Tiemoue Bakayoko and Ola Aina have arrived in Italy to complete transfers to Milan and Torino respectively. The deals are loans with option to buy at the end of the season and their medicals are booked in for tomorrow. Ola Aina was first to arrive in Turin, the 21-year-old full-back greeted by reporters at the Caselle Airport this afternoon. His move is a loan with option to buy for a reported €8m. This evening, Bakayoko also landed in Milan’s Linate Airport and is already at the hotel. His medical is tomorrow, the midfielder moving for €5m on loan with option to buy for a further €35m. This will effectively cancel out the €40m Chelsea paid to get him from Monaco. 7.04pm Leicester City have confirmed striker Islam Slimani has joined Turkish top-flight side Fenerbahçe on a season-long loan. 6.33pm Atletico Madrid goalkeeper Jan Oblak turned down Chelsea as they searched for a Thibaut Courtois replacement, according to the Sunday Times. The Blues were reportedly ready to pay £89.4 million for the 25-year-old, before turning to Athletic Bilbao goalkeeper Kepa once he turned them down. 6.00pm Porto and Benfica are monitoring Stoke forward Bojan and could make loan offers for the former Barcelona man, according to The Sun on Sunday. 4.36pm Juventus are weighing up a move for Bayern Munich defender Juan Bernat, reports Tuttosport. The Old Lady have been linked with a number of full-backs, including Real Madrid’s Marcelo, but they believe Bernat is a more attainable target. 4pm West Brom are hoping to sign Crystal Palace right-back Joel Ward on loan, according to The Sun On Sunday. The report also suggests Stoke City and Blackburn are keen on Eagles striker Connor Wickham. 3.50pm Adrien Rabiot has rejected another contract renewal offer from PSG, reports L’Equipe. Rabiot, who has been heavily linked with Barcelona over the past year, is out of contract at the Parc des Princes next summer. PSG offered him a two-year contract extension which included a pay rise, but he turned it down as he wants to leave the Ligue 1 outfit. He has reportedly received various offers from other clubs. The French capital club are unwilling to sell the 23-year-old this summer. 3.29pm Watford will make a renewed effort to sign Southampton midfielder James Ward-Prowse in January, according to the Sunday Mirror. 3.07pm As reported by timesofmalta.com, Sliema Wanderers have bolstered their roster with offensive signings in Jean Paul Farrugia and Younes Marzouk. We will get you more news on those deals later on during the day. 3.05pm Valencia remain keen to finalise a deal for Liverpool forward Divock Origi, according to the Sunday Express. However, the report suggests Valencia need the Premier League club to cut their £26m valuation for a deal to go ahead. 3pm Good afternoon everyone and welcome to our transfer blog. Stay with us to follow all the latest news from across Europe. 9.46pm That's all from us for today! Join us tomorrow for another day full of transfer news from across Europe. 9.00pm News from Sliema Wanderers as they unveiled two signings ahead of the 2018/2019 BOV Premier League campaign. The Blues added Malta international Jean Paul Farrugia who will feature for the Blues after spending last season at FC Chiasso, in Switzerland. Meanwhile, Sliema have also brought in Younes Marzouk of Morocco, who formerly was of Juventus even though at youth levels. Marzouk, 22, plays forward and he also played for FC Chiasso for whom he scored 12 goals in 18 games in 2017. More details on this transfer will come in the coming days on our platforms. 8.51pm Aston Villa manager Steve Bruce has paid tribute to Jack Grealish's attitude after his proposed move to Tottenham fell through this week and he starred in the 3-2 win over Wigan. "Considering the way he has conducted himself over the last few days he has been a breath of fresh air. I thought the way he played highlights the reason why the Premier League want to buy him. He oozes that little bit of class which was evident against Wigan." ???? E ha già provato la nuova maglia gialloblù! La @SerieA 2018/2019 la giocherà con il suo numero, il 2⃣2⃣! 8.24pm Joel Obi has officially left Torino and put pen to paper on three-year contract with Chievo Verona. The Nigeria international midfielder also has an option to add a fourth year to the deal at the Stadio Bentegodi. His current contract with Toro was due to expire at the end of this season and he underwent a medical today. ???? We're delighted to confirm an agreement with @acmilan for the loan of @andrevsilva19! ???? 7.46pm Sevilla have officially taken Andre Silva on loan from Milan with an option to buy, pending a medical. The Portugal international flew in today and was greeted at the hotel by Sevilla director Joaquin Caparros. It’s reported the one-season loan costs €5m with an option to buy for a further €30m in June 2019. 7.20pm Milan won’t have a buy-back clause on Manuel Locatelli, who is set to join Sassuolo in a total €14m plus bonuses deal. Originally, the midfielder was expected to move for €12m plus €2m in bonuses, but giving the Rossoneri a buy-back clause so he could return for a set fee in future. However, Sky Sport Italia and other sources now claim negotiations have changed the format of the transfer. 6.49pm Diego Laxalt’s transfer to Zenit St Petersburg risks falling apart after Genoa reportedly bumped up the price-tag to €18m plus bonuses. The Uruguay international had an impressive World Cup campaign this summer and made it clear he wanted to move on from Genoa. Although West Ham United, Lazio and Napoli showed interest, Zenit were the most consistent and appeared to be close to a deal. 6.36pm Napoli reportedly offered €30m plus Roberto Inglese in order to get Andre Belotti, but Torino want €60m cash. According to La Stampa newspaper in Turin, Carlo Ancelotti’s side made the proposal over the last couple of days. They value ex-Chievo centre-forward Inglese at €20m, so the cost of their bid is in total around €50m. 6.16pm Roma forward Diego Perotti has emerged as a target for Monaco to replace Inter-bound Keita Balde Diao. It is widely reported that Keita is on his way to Inter, on loan for €5m with an option to buy at the end of the season for a further €34m. Monaco are seeking a replacement and had asked for Antonio Candreva, but the Italy international is not convinced by the move. 6.05pm Despite Lazio President Claudio Lotito’s protestations, there are still reports Milan will offer cash plus Giacomo Bonaventura for Sergej Milinkovic-Savic. Technical director Leonardo said a possible swoop for the Serbian was “difficult,” but not impossible. Now La Repubblica newspaper claims a proposal is being lined up for cash plus Bonaventura. The money would be raised for the midfielder, who is valued at €120m, by selling either Suso or Gianluigi Donnarumma. 5.41pm Cagliari are set to improve their offer for Gremio defender Walter Kannemann to €6m. The 27-year-old Uruguayan centre-back, who can also play as a left-back, is under contract to December 2019. According to Calciomercato.it, the Sardinians are ready to make a new bid after seeing their €4.75m plus bonuses proposal rejected. 5.18pm Balzan's Antonio Mitrev has left the Maltese club to join FK Teteks on loan, in the Macedonian championship. Mitrev, 19, joined Balzan prior the 2017/2018 campaign before moving to Tarxien Rainbows on loan in January. With the Rainbows, he played four games in the BOV Premier League before returning to the parent club. 4.57pm Barcelona have dropped their interest in Paul Pogba, accepting that the Frenchman will not leave Manchester United in this transfer window, according to RMC. However, the Catalans could launch a Philippe Coutinho-style charm offensive to eventually get their man in a future window. 4.43pm Steven N'Zonzi has told Sevilla that he wants to join Roma, according to Gazzetta dello Sport. The Serie A club are interested in the French midfielder, but have yet to make a meaningful offer for him. 4.13pm West Ham midfielder Edimilson Fernandes will have a medical on Sunday ahead of a move to Fiorentina, according to Sky in Italy. Switzerland international Fernandes is set join the Serie A club on a season-long loan with an option to buy. Fernandes has made 48 appearances for West Ham since joining from FC Sion in the summer of 2016. 4.05pm Milan are progressing in negotiations with Chelsea, hoping to take Tiemoue Bakayoko on loan with €35m option to buy. Bakayoko isn’t even on the bench for Maurizio Sarri’s Premier League debut against Huddersfield Town, which kicks off this afternoon. He is frustrated at not being considered a part of Sarri’s plans and, turning 24 next month, wants more regular playing time. According to Sky Sport Italia, Sportitalia and other Italian sources, talks are progressing well for Milan to sign Bakayoko and there were more conference calls today. 4pm Good afternoon everyone and welcome to our transfer blog. Stay with us to follow all the latest news from across Europe. 8.31pm That's all from us for today! Join us tomorrow for another day full of transfer news from across Europe. 8.18pm Milan have left out Andre Silva and Riccardo Montolivo from the squad to face Real Madrid, as the striker is close to Sevilla. The pre-season friendly will kick off on Saturday evening in Spain at 20.00 UK time. Coach Gennaro Gattuso must do without injured Pepe Reina, Ivan Strinic and Ignazio Abate. However, also absent from the list of players are Andre Silva and Montolivo. The Partenopei bought both Alex Meret and Orestis Karnezis from Udinese this summer, but Meret broke a bone in his arm during the second training session and won’t be ready until September. They are therefore trying to get another more experienced figure on loan who won’t block Meret’s future development, but Standard Liege are refusing to budge on Ochoa. 7.30pm Ħamrun Spartans have unveiled Caetano Calil, a Brazilian forward with a lot of experience in particular in Italy. Calil, 34, played 146 games in Serie B with Frosinone, Varese and Crotone, scoring 26 goals in the process. With the latter, he played 114 games with 30 goals and 13 assists. He has also 13 appearances in the Coppa Italia and has also featured twice in the Italian Serie A for Siena during the 2007/2008 season. 7.16pm Lazio have reportedly set a Sunday deadline for Sergej Milinkovic-Savic to receive an offer worth €120m or stay in Rome. According to La Repubblica, the club told him and his agent that if he doesn’t bring in a proposal matching the asking price this weekend, then he won’t be allowed to leave this summer. Real Madrid, Paris Saint-Germain, Juventus and Milan all showed interest, along with Manchester United and Manchester City. 7.04pm Pietà Hotspurs have signed Brazilian defender Tony ahead of 2018/2019 BOV Premier League season. Tony, 28, has experience in Maltese football after playing 33 top-flight matches with Gżira United. Previously, Tony played in Brazil with various clubs including Desportiva-ES and UA Barbarense and also in Italy, with Chieti. 6.20pm Chievo are close to agreeing a transfer for Torino midfielder Joel Obi and he could have his medical tomorrow. 5.43pm Inter transfer target Keita Balde Diao was left out of the Monaco squad to face Nantes and spent the afternoon with his agent. The switch to San Siro should be imminent, as the former Lazio forward does not feature in the AS Monaco squad named for tomorrow’s Ligue 1 opener against Nantes. The official club website lists reasons for the absence of players Andrea Raggi, Almamy Toure, Pietro Pellegri, Adama Traore, Alexandr Golovin and Danijel Subasic, but doesn’t mention Keita at all. 5.20pm So it's another loan spell for Chelsea's Michy Batshuayi, a World Cup semi-finalist with Belgium. The 24-year-old spent the second half of last season on loan at Borussia Dortmund, having found his opportunities at Stamford Bridge limited following the arrival of Olivier Giroud. He scored nine goals in 14 appearances for the Bundesliga side but his spell was cut short in April when he suffered ankle ligament damage. Valencia said: "Valencia CF have reached this Friday an agreement with Chelsea FC for the transfer of Michy Batshuayi until the end of this season." ???????? | Defender @KurtZouma joins #EFC on a season-long loan from @ChelseaFC. 5.19pm It's taken a while for this one to be confirmed but the paperwork was submitted in time and Everton have finally announced Kurt Zouma's arrival on loan for 2018/19. Zouma joins Lucas Digne, Richarlison and Joao Virginia - plus Deadline Day signings Bernard, Yerry Mina and Andre Gomes - at Goodison Park. 5.10pm Celtic have announced Emilio Izaguirre has rejoined the club. The 32-year-old Honduras left-back left Celtic for Al-Fayha in 2017, but has returned to Parkhead. 5.09pm Sky in Germany: Real Madrid are interested in signing Bayern Munich midfielder Thiago Alcantara. The Spaniard was the only player new Madrid manager Julen Lopetegui asked for, the two having worked together with Spain U21s and the senior national side. Karl-Heinz Rummenigge said a few weeks ago that Bayern had no plans to allow the player to leave. A transfer would likely only be possible if Madrid are prepared to make a big offer. 4.28pm Real Sociedad have announced the signing of defender Theo Hernandez on a season-long loan from Real Madrid. Left-back Hernandez, 20, joined Los Blancos from city rivals Atletico Madrid last summer and went on to make 23 appearances. 4.22pm Rangers manager Steven Gerrard says reports claiming the Glasgow club will sign Liverpool striker Dominic Solanke are “pure speculation”. The Daily Record had claimed the Englishman was set to move to Ibrox on loan this season. 4.20pm Kettering Town confirm that attacking midfielder Andrea Borg has joined the club on loan from Peterborough United. The Malta U-21 international international made three senior appearances for the Posh. Borg already appeared for the Poppies in the recent Newlands Shield game against Bedford Town, and will stay with the club on loan until January 2018. 9.01pm That's all from us for today! Join us tomorrow for another day full of transfer news from across Europe. Another #DeadlineDay arrival - Martin Montoya is a Brighton & Hove Albion player! ???????? 8.15pm Brighton have confirmed the signing of full-back Martin Montoya from Valencia on undisclosed terms. The former Barcelona and Inter Milan defender has agreed a four-year contract with Albion. 7.59pm Newcastle have completed the signing of centre-back Federico Fernandez from Swansea City. Sky Sports News understands the fee to be in the region of £6m. The player has signed an initial two-year contract at St James' Park. The Argentine international had a medical on Tyneside this afternoon after a deal was struck between the clubs at at lunchtime. Newcastle turned to Fernandez when their move for Barcelona’s Marlon Santos fell through after the player failed to gain a work permit. 7.50pm Cardiff have announced the season-long loan signing of Harry Arter from Bournemouth. 7.37pm Jamie Vardy has signed a new four-year contract that will keep him at Leicester until 2022. The deal, which will run until he is 35, is likely to see him end his career at the King Power Stadium. Sky sources understand the deal will make the England striker the highest paid player in Leicester City’s history. His old contract, signed in 2016 after Leicester won the title, still had two years left to run. 6.52pm Everton are trying to complete a deal to sign Chelsea defender Kurt Zouma on loan. 6.37pm Jake Livermore will not be joining Watford, who have decided not to pursue a deal for the West Brom midfielder. 6.25pm Liverpool striker Danny Ings could still get a move to Southampton on a season-long loan deal. The deal sheet has been submitted for extension by Southampton and they now have until 7pm to complete the transfer. 6.15pm Sky sources: Brighton appear to have snatched Martin Montoya from the clutches of Fulham. Sky Sports News understands that, in the last few hours, the Seagulls have agreed a deal with Valencia and the right-back is close to completing the move to the south coast. Earlier on Deadline Day we told you that Fulham were in talks for the 27-year-old Montoya to fill the void at right-back. But Fulham have now moved on to Manchester United’s Timothy Fosu-Mensah and they are close to bringing him to Craven Cottage. 6.13pm Fulham have agreed £30m deal to sign Marseille midfielder Andre-Frank Zambo Anguissa. The Fulham medical team are in France for the medical. 6.12pm Barcelona have announced they have reached an agreement with Everton for the transfer of Andre Gomes. ??? ?️ David Wagner: “When we first spoke, it’s clear that he is a real winner." 6.10pm Huddersfield have signed Montpellier winger Isaac Mbenza on a season-long loan. The club have the option to make it a permanent deal at the end of the season. 6.02pm Barcelona have announced they have reached an agreement with Everton for the transfer of Yerry Mina. 6.01pm Fiorentina's Carlos Sanchez has passed a medical and agreed terms on a move to West Ham, according to Sky sources. 5.57pm Everton have confirmed the signing of Brazilian midfielder Bernard. 5.45pm Sean Cini is another signings for Jose Borg's Tarxien Rainbows for the upcoming 2018/2019 season. The 36-year-old goalkeeper is a former player of the Blues having played part of the 2014/2015 Premier League season with them and has rejoined the club after various experiences across Malta. Among the clubs he played for, Cini featured for Vittoriosa Stars, Mqabba, St. George' s and recently Sirens. 5.42pm Fulham are close to agreeing the loan signing of striker Luciano Vietto from Atletico Madrid, according to Sky sources. ‼️✍️ Ufficiale: Adrian #Semper è un nuovo giocatore dell'@ACChievoVerona! Arriva dalla @gnkdinamo in prestito con diritto di riscatto! 5.29pm Chievo have officially confirmed the signing of Adrian Semper on loan from Dinamo Zagreb with an option to buy. The 20-year-old is a Croatian Under-19 international, and spent last season on loan at Lokomotiva. “A.C. ChievoVerona announces the signing of the goalkeeper Adrian Semper on loan until 30/06/2019 with an option to buy,” the statement on the Flying Donkeys’ website reads. 5.28pm Fulham are closing in on a deal to sign Timothy Fosu-Mensah from Manchester United, according to Sky sources. Acuerdo con el @acmilan para el traspaso de Kalinic. ¡Bienvenido Niko! ????⚪???? 5.27pm Croatian striker Nikola Kalinic has joined Atletico Madrid. The 30-year-old has signed a three year deal after signing from Milan. 5.26pm Huddersfield Town defender Michael Hefele has joined Nottingham Forest for an undisclosed fee on a three-year deal. 5.18pm Bernard has agreed personal terms and received his work permit ahead of a move to Everton, Sky Sports News understands. The Brazilian is set to be confirmed as an Everton player in the next hour. Everton are reportedly hoping to sign Marcos Rojo from Manchester United for £22m before the transfer window closes, according to The Telegraph. 5.15pm Arsenal goalkeeper David Ospina has agreed personal terms with Besiktas. The Colombian has been told he can leave north London this summer following the arrival of Bernd Leno from Bayer Leverkusen. Breaking | Everton have reached an agreement to sign Kurt Zouma from Chelsea, according to L'Équipe. More follows. 5.10pm Everton are closing in on a loan deal for Chelsea defender Kurt Zouma, according to L’Equipe. 5.09pm Tiémoué Bakayoko’s imminent move to Milan has cleared the way for Manuel Locatelli to join Sassuolo, whose sporting director is meeting the Rossoneri. The Diavolo are close to securing a loan deal for the Chelsea midfielder, who cost around €45m just a year ago. Milan had previously pulled the plug on talks for Locatelli, but with a midfield reinforcement arriving they are once again open to a loan deal. According to Sky, Neroverdi sporting director is currently at Casa Milan to negotiate with Leonardo over a deal. 4.58pm Sliema Wanderers have added a midfielder to the squad after they brough in Ayrton Azzopardi. The 24-year old, featured for the Blues last season after joining in from Tarxien Rainbows during the winter transfer window. The former Hibernians player has 72 appearances, with 10 goals and 13 assists in the BOV Premier League. 4.31pm Suso’s agent has been spotted meeting with Roma, but Milan would demand at least €30m to sell him. The Spaniard has been consistently linked with the Giallorossi this summer, but both general manager Leonardo and Coach Gennaro Gattuso have made it clear he’s a key man at San Siro. Despite that, Sky Italia spotted Alessandro Lucci leaving Trigoria, indicating that the Lupi aren’t giving up on Suso. 4.21pm Carpi could reportedly send Zinédine Machach back to Napoli, after a fight with two teammates in training. The French midfielder has been sent on a season-long loan to the Biancorossi, but that could end before the Serie B campaign has even started. According to the Gazzetta di Modena, the 22-year-old started a fight with two teammates, including a youth player, in training on Tuesday. No official sanction has yet been handed down, but Carpi are seriously considering terminating his loan. SKY SOURCES: Harry Arter to have @CardiffCityFC medical ahead of loan move from @afcbournemouth. 4.15pm Harry Arter is on his way to Cardiff City for a medical ahead of a loan move from Bournemouth. Sky sources: @LCFC are close to agreeing a season-long loan deal with @Fenerbahce for striker Islam Slimani. 4pm Leicester are close to agreeing a deal with Fenerbahce for striker Islam Slimani to go on a season-long loan to Turkey. 3.45pm Wolves have announced the signing of Belgium midfielder Leander Dendoncker from Anderlecht on an initial season-long loan, which will become a permanent move next summer. 3.35pm Premier League newcomers Cardiff City have signed Real Betis midfielder Victor Camarasa on a season-long loan deal, the Welsh club said on Thursday. The 24-year-old Spaniard passed a medical at Cardiff's training ground on Thursday and could be in line for a debut in their opener at Bournemouth on Saturday. Camarasa, who came through Valencia's academy, helped Betis finish sixth in La Liga last season. "He was never going to end up at Old Trafford during this window." A bit more on that Man Utd move for Diego Godin. 3.25pm Interesting take from SkySports reporter Dharmesh Sheth on Diego Godin's refusal to join Manchester United. "Godin’s agent was actually the one who approached Manchester United this week, saying the player was keen to come to Old Trafford and a deal could be done. "It’s my information that United made an offer for the agent to take to the Atletico board and within hours Godin signed a new contract on improved terms at Atletico Madrid, earning him 7.5m euros net per year. "To be clear, Mourinho would have been keen to sign Godin, but he believes the desire on the agent’s part was always to leverage the situation to get a new contract for his client." Reece Oxford looks set for a return to Germany with Hannover, RB Leipzig and Frankfurt all keen on the defender. 3.10pm Reece Oxford looks set to head back to Germany before the end of the month, SkySports is reporting. Hannover, RB Leipzig and Frankfurt are all keen to sign the West Ham defender. 3pm Parma and Frosinone are both said to be interested in signing forward Alessandro Matri from Sassuolo. Local newspaper Gazzetta di Modena reports the 33-year-old is heading towards an exit from the Neroverdi, given the hot competition for places in Roberto De Zerbi’s starting line up. Former Juventus and Milan man Matri made 25 appearances for Sassuolo in all competitions last season, but scored just three goals. And the Gazzetta claims two of Serie A’s three newly-promoted clubs are keen on securing his signature in this transfer window, with both Parma and Frosinone having made their interest known. 2.40pm Milan have reportedly offered Luca Antonelli to Real Betis, but they're focused on other targets. The defender currently looks set to be third-choice left-back, as Ivan Strinic has arrived to be backup to Ricardo Rodriguez. According to El Desmarque, the Rossoneri have offered Antonelli to Betis, and he would be willing to move to get more playing time. However, the Andalusian club are focused on trying to sign Nicolás Tagliafico from Ajax, with Martin Montoya and Kevin Mbubu as alternatives. 2.26pm Bacary Sagna signs for Canadian club Montreal Impact after leaving Benevento earlier in the summer. The former France international became a free agent after opting not to extend his contract with Le Streghe following their relegation to Serie B. And his next move has now been confirmed, with the 35-year-old signing a deal with the Major League Soccer club until the end of 2018. The terms also include the option of extending his stay in North America by another year. 1.50pm Atletico Madrid Coach Diego Simeone rules out the possibility of signing his son Giovanni from Fiorentina. The Spanish club have been linked with a €40m move for the Viola forward this summer, who scored 15 goals in his debut season at the Artemio Franchi. But speaking at a Press conference, Simeone Sr said he wants to see the 23-year-old continue to develop elsewhere for the time being. “I like him very much as a player. I am happy with the way he is developing in Italy,” the Atletico boss commented. “However, I don’t think this is the right moment for us to be reunited together. 1.32pm Ademola Lookman, who was far from in favour under ex-Everton boss Sam Allardyce last season and spent the second half of the campaign on loan at Red Bull Leipzig, is likely to stay at Goodison Park at the end of this transfer window. 1.25pm Thibaut Courtois has completed his move to Real Madrid from Chelsea, and has been unveiled by the Spanish club. BREAKING: Atletico Madrid reject Manchester United's approach for defender Diego Godin, according to Sky sources. 1.15pm Things are not looking good for Manchester United. The club have triggered the player's release clause and offered him £9 million per season but the Uruguayan has rejected their offer. Wolves have agreed a fee with Manchester City for Oleksandr Zinchenko, @SkySportsNews understands. 1.05pm Wolves are still hopeful of completing a deal for Manchester City wing back Oleksander Zinchenko before 6pm, and they’re still working hard to persuade the player that his future lies at Molineux. Wolves have lined up a medical for him this afternoon, but Zinchenko has not left Manchester, and is still undecided about a move to a newly-promoted side. Q: Do you still want to continue at Real Madrid? 12.55pm Real Madrid goalkeeper Keylor Navas says the signing of Belgium keeper Thibaut Courtois has not affected his desire to remain at the triple European champions as he emphatically ruled out leaving the club in order to be assured of first team football. "Tell everyone loud and clear, I have as much enthusiasm for leaving Madrid as I do for dying," Navas told reporters after Real's 2-1 victory over AS Roma in a friendly at the Metlife Stadium in New Jersey on Wednesday. 12.40pm Everton look to be inching towards success in their pursuit of Yerry Mina, fresh from his three-goal haul at the World Cup - he's a centre-back with the Colombian undergoing a medical. Mina has been on Everton's radar for several weeks, and they look like just beating the clock to bring him to Goodison Park. 12.25pm Leicester City have signed Croatian defender Filip Benkovic from Dinamo Zagreb on a five-year deal, the Premier League club said on Thursday. Manchester United are chasing a deal for Atletico Madrid defender Diego Godin, Sky Sports News understands. 12.10pm BREAKING NEWS ... Manchester United are chasing a deal for Atletico Madrid defender Diego Godin, Sky Sports News is reporting. 12pm Premium Sport reports Juventus midfielder Stefano Sturaro is set for a loan move to Premier League side Watford. The Italian sports news outlet claims the 25-year-old has agreed to move to the Hornets on an initial season-long loan, with his new club having the option to make the transfer permanent next summer for €18m. Sturaro has been at Juve for three years since joining from Genoa in 2015. However, he has grown frustrated by a lack of regular game time under Coach Max Allegri. And despite Allegri considering the Italian a useful squad player, Sturaro appears poised to complete a move to the north of London on the English transfer dealine day. 11.50am Fulham have reached an agreement in principle with Sevilla over the loan of goalkeeper Sergio Rico, reports Cadena SER. The two clubs have reportedly struck a deal in which the 24-year-old will spend this season on loan at Craven Cottage. It is not clear if the agreement includes an option to make the loan permanent. 11.38am Chelsea striker Michy Batshuayi wants to play for Valencia, reports Marca. Batshuayi has decided to leave Chelsea this summer and wants to move to Valencia, who are keen to sign him on loan. The 24-year-old Belgium international has also attracted interest from Atletico Madrid, Sevilla and Borussia Dortmund, where he spent the second half of last season on loan. 11.30am Jose Mourinho is not optimistic that Manchester United will bring in any players today. "The information I have is no. I’m not confident. The market closes today so there’s time at least for me to stop thinking about it.